Stefano Amadei was born in Perugia. He was a mathematician as well as an artist, and studies perspective and design. He was among those responsible for the resurgence in the fortunes of the Accademia di Belle Arti in Perugia in the 17th century. ✴Giovanni Francesco Morelli saw it above the high altar of the Oratorio di San Bernardino in 1683. 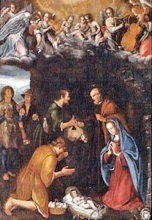 It was in a reconstruction of the original work that also included a copy (1609) of the main panel that is attributed to Giuseppe Cesari, il Cavalier d’ Arpino. He described this upper panel as a copy by Stefano Amadei. ✴Giuseppe Maria Modestini saw it above another altarpiece on the Altare del Presepio of San Francesco al Prato in 1787. He believed that it came from the original altarpiece by Raphael. There is still no consensus on the status of the panel in the gallery. If it is indeed a copy, the location of the original is unknown. Scholars who deem it to be original concede that it is a workshop painting that follows Raphael’s design. (One such design, which is attributed to Raphael) survives in the Palais des Beaux Arts, Lille). Umberto Gnoli attributed it to Domenico Alfani (referenced in the page on this artist). However, the gallery notes support the theory that it is a copy by Stefano Amadei. This panel by Stefano Amadei [,which is dated by inscription,] is in San Severo. ✴the Marriage of the Virgin.